As the El Dorado Trail campaigns for more improvements to its remaining tracked areas, the excitement among locals and tourists grows. Imagining the day when our entire trail is finished, the minds wonders to all sorts of possibilities. Looking to other beautifully converted trails, it is easy to see why there is so much support for our own. One such trail that ‘has it all’ is nearby Coyote Creek; this trail is well worth a visit for all those that are curious as to the benefits El Dorado’s Trail will eventually bring to its surrounding areas. Upon a visit, it is easy to see why trails are so important to their respective local areas. The 22.1 mile trail is situated in Santa Clara County, starting from Tulley Road at Galveston Avenue to Morning Star Dr. at Eagle View. It also has a smaller north potion that stretches from Montague Expressway to Southbay Freeway. Fixed with mainly asphalt and crushed stone surfacing, the trail allows for many different types of activities – from biking to horse riding, but is also popular with inline skaters and the more adventurous mountain bikers. The Coyote Creek Trail enjoys much the same level of beauty as that of El Dorado. Similar in terms of length, the trail meanders south of the city of San Jose and alongside its namesake creek. It is often regarded as a great starting point for those new to trails thanks to its paved surface and lack of elevation. As a result, the trail is popular with families, as well as runners, cyclists and inline skaters. Although the scenery varies thanks to the sheer length of the trail, the surface largely stays consistent throughout, making this an ideal choice for trail beginners, strollers and casual users. Visitors to Coyote Creek get the best of both worlds; in addition to paved bike paths, many segments of the trail are fitted with gravel equestrian pathways running parallel. This, along with the natural beauty of the creek, make it extremely popular with horse riders and riding schools alike. The trail is extremely diverse; those embarking on the entire trail can enjoy travelling through parkland, residential areas, woods, orchards and water. Many will argue that the best time to visit the trail is during fall, when hues of brown, orange and red leaves line the pathways and fill the air, and the low golden sun glistens invitingly in the streams. At the south end of the trail lies Hellyer Country Park, which is packed with things to do for all the family. Not only is it a fantastic place to start or end your journey, but it’s also a hub of entertainment. It is, of course, home to the Hellyer Park Velodrome – an Olympic sized bike racing rink – as well as containing shaded picnic areas, playgrounds, volleyball courts and designated ‘dog areas’. Not only is Coyote Creek blessed with practical benefits and facilities, it is also a hub for art and creativity. Public art lines the walkways, and is the subject of much interest and intrigue from passers-by. Carefully selected work by a plethora of local artists includes paintings, sculptures and statues, many of which are inspired by the trail’s history as an important rail link for surrounding local areas. The variation of art along the trail pays homage to the outstanding natural beauty of the area and it is easy to see why art and creativity plays such a big part in the character of this trail; put quite simply, there is a lot to be inspired by at Coyote Creek. Its importance as a link between urban and countryside, as well as its picturesque rolling hills and pretty lakes and streams, act as much inspiration to artists that come here. Coyote Creek Trail is not just a recreational haven. It is also an important transport link and access point to many parks in both the city and the countryside. Again, thanks to its surfacing and elevation, it is so convenient and easy to use that many people use it as a commuting route. It also connects to the Highway 237 Bikeway, making it perfect for cyclists looking for a hassle-free way to get in and out of the city. 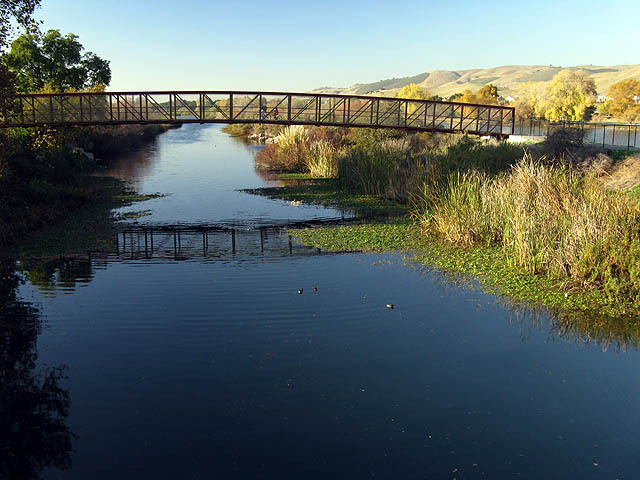 With ample access – car parking is plentiful at many entry points along the trail – and facilities that go above and beyond those of an average trail, Coyote Creek is an exemplary trail that other non-converted disused rail lines should aspire to. Indeed, the beauty of El Dorado could also be heightened and showcased through the use of our own, fully converted trail.